The construction to build a graph $G’$ that is 3-colorable if and only if the original graph $G$ is 4-colorable is the following. Every node $n_i$ of the original graph $G$ is replaced with two nodes $n_i’$ and $n_i”$. We add a common triangle with three new nodes and an edge between its “Red” $R$ node and each $n_i’$ and $n_i”$, in this way all $n_i’, n_i”$ must be colored $T$ or $F$. 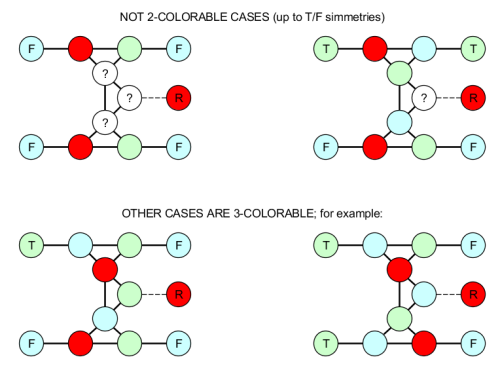 Note that we simply label “red” the color assigned to the vertex of the common triangle that we connect to the nodes $n_i’, n_i”$ (in a valid coloring R,F,T are interchangeable) . We replace each edge $e_h = (n_i, n_j)$ of $G$ with the edge gadget showed in the figure. The edge gadget that replaces the original edge $e_h = (n_i, n_j)$ acts as a comparator between the two side: if $n_i’$ and $n_j’$ (resp. $n_i”$ and $n_j”$ ) have the same color, then one of the two inner nodes that connect them in the edge gadget must be red. As a consequence, if both $n_i’ = n_j’$ and $n_i” = n_j”$ then no node of the central triangle can be colored with red; note that red is already forbidden in the middle node of the central triangle because it is connected to the common $R$. Allowed/forbidden 3-colorings of the edge gadget. 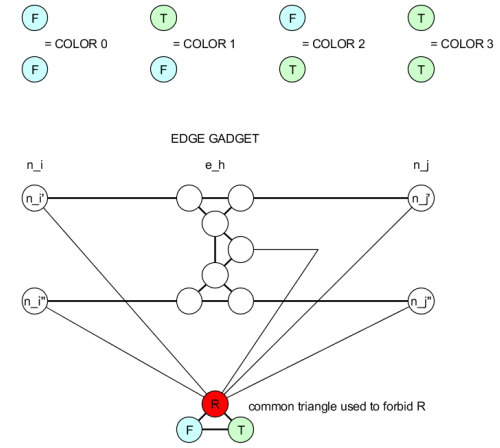 So the edge gadget is 3-colorable if and only if $(n_i’ \neq n_i”) \lor (n_j’ \neq n_j”) $. But the colors of $n_i’, n_i”$ represent the two bits of a 4 color so the edge gadget is 3-colorable if and only if in the original graph we can assign to $n_i$ and $n_j$ two different colors among the 4 available. We can conclude that the whole resulting graph $G’$ can be 3-colored if and only if the original graph $G$ can be 4-colored. A similar technique could be applied to the reduction $COL_a \leq COL_b$ when $a = 2^m$ expanding the edge gadget. Open problem: is there a simpler $COL4 \leq COL3$ reduction ?